Once people work their jobs, you need to mark them complete in the system so that they receive credit for them. Navigate to Past & Archived events. Chameleon users: Go to the Events page. Click Past & Archived tab and find the event that needs to have the jobs confirmed. Click the Job Sign Up button by the event. 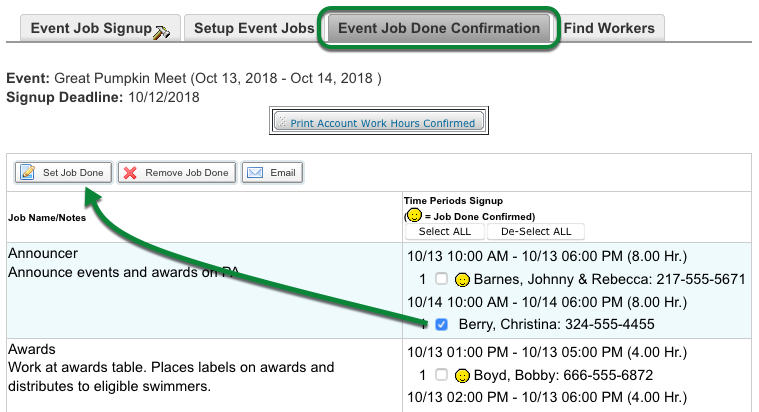 Click the Event Job Done Confirmation tab. Check the boxes by completed jobs. Click the Set Job Done button, then OK to confirm. A smiley face will appear next to those jobs and the selected accounts will receive credit for the jobs worked. If you accidentally mark incorrect jobs as complete, just select them again and click Remove Job Done. This will create an entry in the selected account(s) for the negative amount of hours/points listed, thus canceling the incorrect entry.